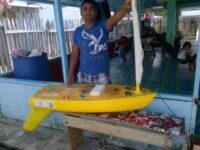 It traveled back across the Atlantic and landed in Georgetown, Guyana on 13 December 2014 after a fishermen grabbed it from the waves. 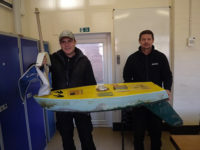 After a few weeks of investigations, the fishermen was found and the boat was recovered. The quest is still on to get the Charger home from Guyana. An article in the Soundings Magazine was published asking for help. 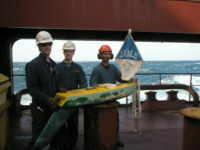 She was relaunched in May near the Azores. 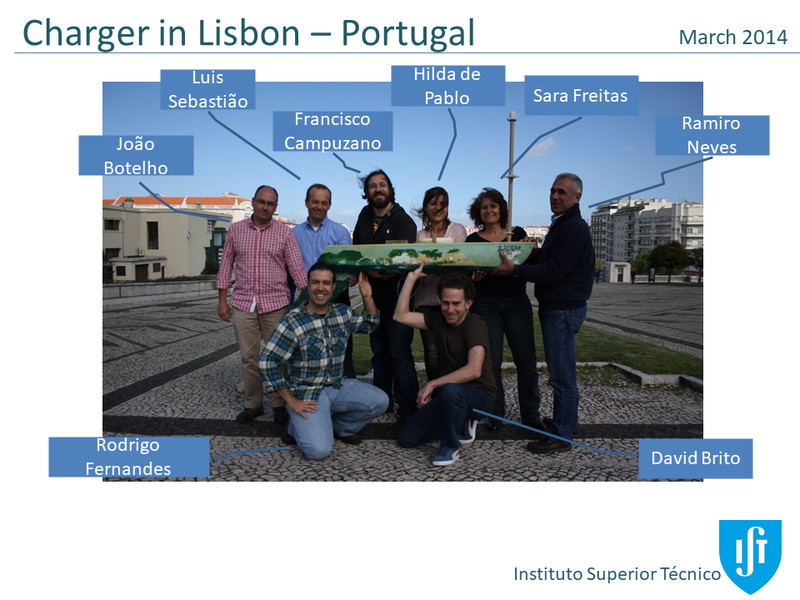 The Charger was refurbished by the Institute for Systems and Robotics in Lisbon. 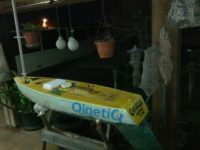 On 29 January 2014, Charger landed on a sandy beach in Torreira, Portugal where it was picked up by a variety of groups that have shown interests. 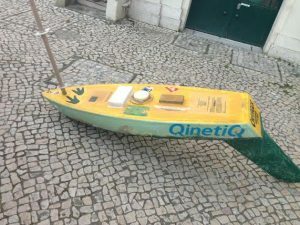 This include the Portuguese National Agency for Scientific and Technological Culture and the European project Sea for Society. It is pictured below in Lisbon prior to restoration. 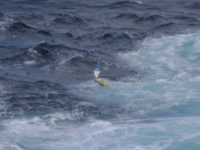 Charger was refurbished with a new transmitter, and, thanks to the help of Captain Sulin, the Tarrant Family, and Teacher Bobbi Nidzgorski, after traveling across the ocean a few times onboard the Philadelphia Express, was finally deployed SW of the Azores on 30 March 2013. 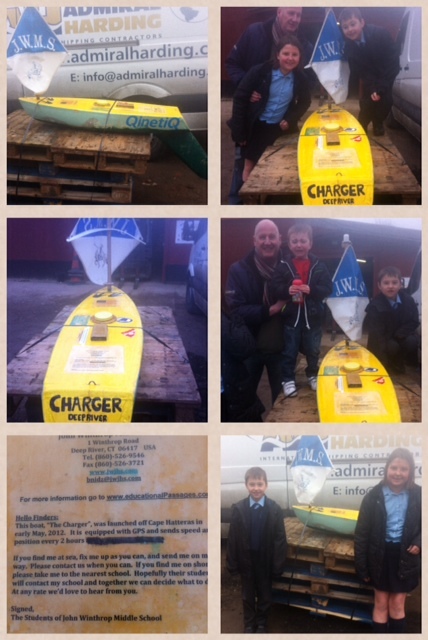 On January 9, 2013 we received an email from Katie Martin that “Charger” was found in good condition on the beach in Carmarthen, Wales during a routine beach check by an environmental officer. 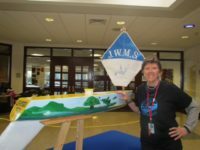 John Winthrop School then made plans to have the boat relaunched and see if they can get her to be the 1st mini-boat to complete the Atlantic Circle. She was “banged up a bit” and was refurbished by Dwight Howse of the St. Johns School of Ocean Technology Marine Institute and was redeployed by an oil rig supply boat along with “Sea Tiger.” “Charger” survived hurricane Rafael in mid-October but sent her last GPS report on November 7, 2012 at about the time Hurricane Sandy went through. 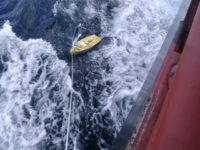 She was relaunched on June 1, sailed north and went ashore again on a remote island called Oderin off of south eastern Newfoundland on August 21. 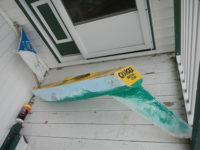 Perhaps one of our most colorful and decorated boats, painted with a Connecticut River scene which led to the ocean, whales and seabirds. “Charger” was launched on May 18 with four other boats (Upper, Sea Tiger, Yarmouth Clipper Ship, and Millinocket) north of the Bahamas by the Maine Maritime Academy’s Training Ship the State of Maine. 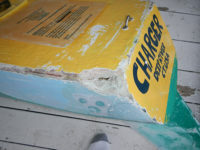 Charger was blown ashore on Myrtle Beach, SC, on May 29 where she was found undamaged.